Our organization has earned huge accolades in the Flask Holder . For the total consumer satisfaction, we are into brining forth a wide array of Volumetric Flask Holder. Our Volumetric Flask Holder is smoothly working and extensively used for many industrial applications. Moreover, our Volumetric Flask Holder is highly durable as well as perfect in finishing. Screw type and spring loaded for holding conical, round bottom flasks. Available in various sizes to suit flask capacity and size. The above holders are provided with strong steel jaws and polished wooden handles for easy handling. 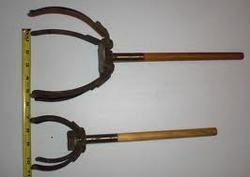 199 Crucible & flask tong holder 15" 199A Bent Crucible Tong 18"